﻿ Internet Options in Rural Parts of France: Is satellite worth it? Internet Options in Rural Parts of France: Is satellite worth it? Depending on where you live in France, an ADSL connection may be slow, and fiber may be unavailable. But fortunately, there are other solutions to connect your home or second home in France in a zone blanche, the most common one being satellite. 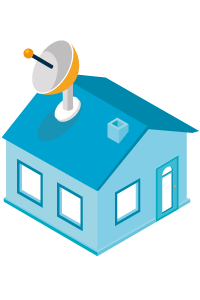 Satellite Internet uses geostationary satellites (meaning that the satellites remain in a fixed position relative to a certain point on Earth) to deliver internet signals to your home (rather than telephone lines or cable systems). 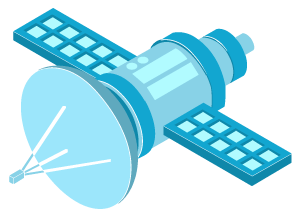 Three main pieces of equipment are required for Internet via satellite: a geostationary satellite (in space), a satellite dish (mounted on your home), and a modem (which transmits internet signals from the dish to your computer/electronic device). While satellite Internet remains slower than fiber optic and high-speed ADSL, it is a vast improvement on dial-up Internet (satellite Internet can be 10 times faster than dial-up). In fact, at 2Mb/s to 22Mb/s depending on the operator and plan, speed for Internet via satellite can reach close to ADSL speeds. Check how fast your Internet speed really is by taking our Internet speed test - it's free and instant. NordNet: created in 1995, NordNet is now a subsidiary of Orange, and provides satellite Internet, ADSL, Internet security, and website hosting services. Its emblematic offer, VEGA Satellite, is on the market for €36.90 per month. To subscribe to a satellite plan with Nordnet, you can ring one of our English-speaking advisors at 09 77 55 72 27, or ask for a free callback. Europasat: established in 2008, Europasat is a leading provider of satellite internet in Europe, available in over 30 countries. This provider has offers from 10 to 100GB of data between 16Mb/s and 50Mb/s in reception, and unlimited communications at night. To subscribe to a satellite plan with Europasat, you can ring one of our English-speaking advisors at 09 77 55 72 27, or ask for a free callback. Numerisat: Numerisat offers speeds of up to 30 Mbit/s, for rates ranging from €23.90 to €79.90/month. Ozone: Ozone offers an Internet via satellite plan from €29.90/month, for speeds of 20Mb/s (downstream and 2Mbit / s (amount), monthly envelopes from 10 to 50GB, unlimited calls and of the HD TV. SkyDSL: SkyDSL offers 3 satellite plans, with theoretical rates of 12 to 24 Mbit/s, with prices ranging from €19.90/month to €49/month. Note that the providers Vivéole, IDHD, Sat2way have been repurchased by Europasat. As for Alsatis, it has now stopped offering Internet via satellite offers, and Connection Verte ceased to exist in 2016. Depending on where you live and your needs, satellite Internet may be more practical than signing up for a ADSL Internet plan. Internet access is still unavailable in some parts of rural France, which are too far from broadband subscriber access nodes to be able to access Internet connection. If your home is located in one of these zones blanches, ADSL broadband is not an option in your area, leaving you with accessing Internet via cellular networks (3G/4G), WiMax, or satellite. Of these options, satellite Internet offers the best speeds and reliability. However, if your home is in an area in which ADSL is slow but still available, satellite may or may not be the best option, depending on your needs. Interested in Satellite Internet?Call our English-speaking customer service at 09 77 55 72 27 (Monday - Friday, 9:30 am - 7:30 pm) or get a free callback, to help you find the satellite solution that meets your needs. While prices can vary greatly amongst providers, on the whole Internet via satellite is more expensive than ADSL, especially when the required equipment is taken into account. Indeed, a satellite kit can range from €100 to €400, though some providers include the cost of the equipment in their plans. An ADSL modem - often called a "box" - on the other hand, often comes as part of a monthly plan, or can be rented for as little as €3/month. Once the satellite equipment is purchased and installed, plans can be comparable to ADSL plans, some as cheap as €20/month, though data volume is limited. More generous data allowances with satellite Internet are more expensive, and can reach up to €90/month for 100GB or more. Depending on the speed of your ADSL connection, satellite Internet can often be an interesting alternative. Some satellite providers offer plans that deliver Internet speeds equivalent to ADSL connections (22Mb/s). However, keep in mind that satellite Internet speed can sometimes be affected by the weather, which can sometimes slow or even cut connections. Satellite Internet data allowances can range from very small (the cheapest options - as little as 2GB/month) to 100GB/month to unlimited data. ADSL Internet data allowances, on the other hand, are unlimited. However, keep in mind that most satellite providers offer unlimited data allowances at night - check with your provider to determine the hours. Some satellite providers offer monthly plans sans engagement, allowing you to leave at any time without penalty. Others, however, only offer plans with a contract (avec engagement) obliging you to stay with the same provider for 12 to 24 months. It is easier to find an ADSL provider that offers a contract-free plan than a satellite Internet provider. Similarly, if the volume of data is potentially unlimited thanks to the night hours, in the case of a commitment of 24 months can seem excessive compared to the current commitment periods - or absence of committment periods - of the ADSL and fiber internet market. If in a "zone blanche", satellite is a good solution, the choice isn't as straight-forward in a geographical area where ADSL is accessible for a low rate. It is then a question of choosing between the performance of the internet connection and the price, with a decision coming down to a tradeoff between speed and cost. Indeed, the satellite will indeed be particularly expensive, but it is a faster alternative to the slowness of an ADSL connection.